Usage: Soy has been shown to promote cell growth and promote long term health, wellness and longevity. The health benefits of soy are being reported worldwide. Scientific interests in Soy centers on the key phytoestrogens, isoflavones. Recommended Daily Dosage: Take two capsules in the morning and two capsules in the evening. For best results, take with a large glass of warm water just before eating. For preventing bone loss in post-menopausal women, increase daily dose to 5 or 6 capsules. Q. 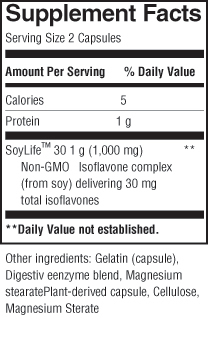 Which isoflavones do Nature's Way Soy Isoflavones contain? A. Nature's Way Soy Isoflavones contain all six naturally-occurring isoflavones: genistin, daidzin, glycitin, genistein, daidzein, and glycitein. Q. How are isoflavones said to help with osteoporosis? A. Scientific research shows that soy isoflavones increase bone density in post-menopausal women. Two prominent isoflavones, genistein and daidzein, have been suggested to have estrogen-like activity in bone metabolism. Japanese women have half the rate. A. Isoflavones are plant chemicals phytochemicals found only in leguminous plants, particularly in soybeans. Usage Warnings: Isoflavones are not recommended during pregnancy or lactation. Other Ingredients: Gelatin (capsule), digestive enzyme blend, Magnesium Stearate plant derived capsule, cellulose, magnesium sterate. Estrosoy Plus, Menopause Formula, 60 caps Estrosoy black cohosh supplement is a menopause formula with enhanced absorption. EstroSoy, 60 caps EstroSoy from Nature's Way is a unique soy extract supplement containing fermented soy consistent with the scientific research. Menopause Formula, 32 oz The fruit of the Morinda Citrifolia (NONI) plant has been treasured for thousands of years by the native people inhabiting the exotic island of Tahiti.